Muhammad Ali reveal the butterfly behind the bee." 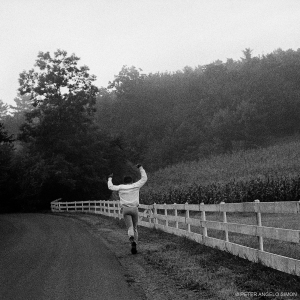 Peter Angelo Simon's historic photographs are available in three forms: a Poster, Individual Prints, and a Collector's Portfolio. 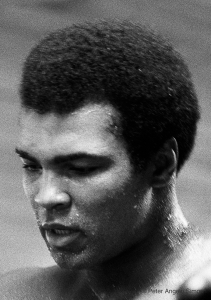 These pictures take you inside Ali's remote training camp and reveal the imaginative way the Champ readied himself for the "Rumble in the Jungle," the brutal 1974 Championship fight against George Foreman in Africa. Limited Edition of 50: Each print is numbered and signed by the photographer. Each poster comes with descriptive captions for the 9 images, the photographer’s notes on the shoot, and its own Certificate of Authenticity. Price: special introductory offer $400. Twelve key images from Simon's archive are available for order. 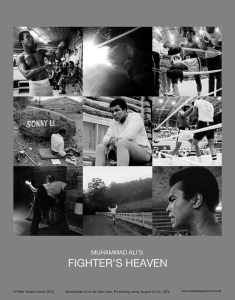 Additional images showing a wide variety of Ali's activities and moods at Fighter's Heaven will be posted shortly. All prints are signed by the photographer. Dimensions: Images are available in sizes 11"x 14", 17"x 22", 20"x 30". The complete set of twelve images comes in a custom presentation box bearing a photograph of Muhammad Ali. Each Collector's Portfolio comes with the photographer’s notes on each image and a Certificate of Authenticity. Media: Twelve hand made Gelatin silver prints on fine art fiber paper. Collector's presentation box is handmade of archival materials.